The horse chestnut comes from a 10 story tall tree that is native to the Balkan Peninsula. The chemical composition of the seeds and bark of this tree have been making waves in the natural healing and scientific communities for decades recently, and with good reason. There is evidence to suggest that horse chestnut cream, derived from these seeds may provide many healing benefits to both cosmetic and painful ailments. Aescin is the compound of most interest to the makers of horse chestnut cream. This component is the primary source of horse chestnut benefits. While there are many natural goodies contained in horse chestnut seed extract, aescin is the most remarkable, notably for its anti-inflammatory properties. 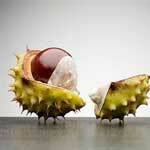 The uses of horse chestnut cream are primarily two and the first is varicose veins. By changing the fluid balance and tone of varicose veins, horse chestnut cream is thought to be able to reduce the edema, swelling and inflammation associated with these unsightly leg afflictions. Varicose vein treatment is a popular cosmetic industry and products like horse chestnut cream are becoming increasingly popular. Hemorrhoids are another area where cream derived from the horse chestnut can be beneficial. Because hemorrhoids are similar to varicose veins in function, it’s easy to see how horse chestnut has become a popular entry amongst the many hemorrhoids home remedies. Even though products made from horse chestnut have shown some evidence to be effective in treatment for varicose veins, more study is needed to fully endorse them as effective treatment products for hemorrhoids. If you are considering horse chestnut as a home remedy for any condition, it should be done under the direction and supervision of a health care provider. As with all medicines, natural remedies can cause side effects, and you will want to ensure that you are using horse chestnut safely and properly and minding dosage instructions if taking the extract form orally. Some medications such as those intended for anticoagulation can interact with horse chestnut, and medications commonly used by diabetics can also interact with this natural remedy. As such, proper consultation with a health care provider is advisable before use, particularly if you have existing health conditions or are taking any medications.